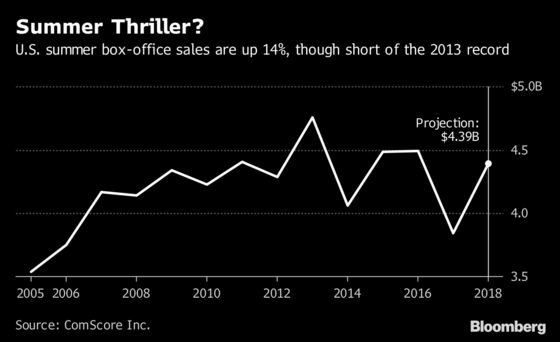 (Bloomberg) -- Movie theaters are having their best summer in two decades, reversing the losses from 2017’s disappointing season and showing resiliency in the Netflix era. North American ticket sales will close out the summer season with a more than 14 percent increase, research firm ComScore Inc. estimated, fueled by the outsize performance of Walt Disney Co.’s “Incredibles 2” and “Avengers: Infinity War.” That’s the percentage gain since 1998. The season officially draws to a close with the Labor Day weekend in the U.S.
“The notion that streaming has led to a decline in cinema attendance is really over-exaggerated,” said Phil Contrino, a spokesman for the National Association of Theatre Owners. Summer ticket revenue, always dependent on the studios’ big-budget pictures, can be volatile. Last year, sales plummeted a similar 14 percent when a few major releases came up short. Still, the spoils aren’t shared equally. Disney has almost doubled its sales from a year ago, according to Box Office Mojo, while Universal Pictures and Paramount are also up substantially. But other major studios are down. One concern that may also may fade is the disruption caused by MoviePass, which shook the industry by offering unlimited moviegoing for under $10 a month. Constrained by losses, the service is now limiting customers to three movies a month, and major exhibitors including AMC Entertainment Holdings Inc. have come up with their own subscription plans. With the summer bouncing sharply higher, analysts are raising their forecasts for the full year, crediting the Disney blockbusters and surprise hits like “Crazy Rich Asians” and “The Meg,” an action film about a giant shark. Leo Kulp, an analyst at RBC Capital Markets, predicts full-year growth of 5 percent, reaching a new record, after projecting a flat 2018 previously.